On Wednesday, February 6, 2013, U.S. Rep. Harold “Hal” Rogers (KY-05) welcomed Coach John Calipari to Capitol Hill to tour the nation’s Capitol and meet with fellow lawmakers. On February 7, Coach Calipari and Assistant Coach Orlando Antigua will join Chairman and Mrs. Rogers as their guests to the National Prayer Breakfast. 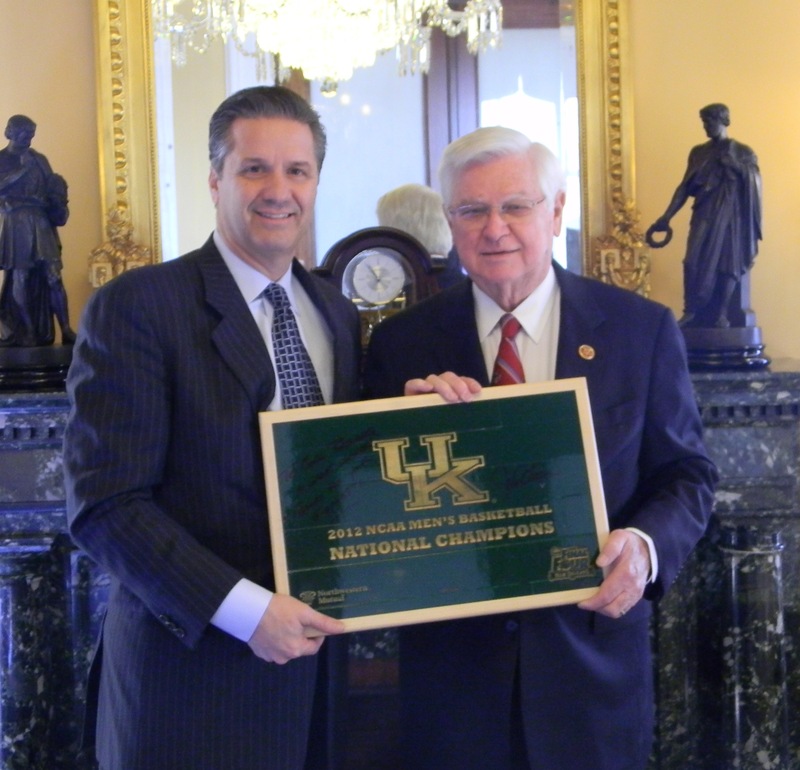 Photo Cutline: Calipari presents Rogers with a piece of the floor of the 2012 NCAA National Championship game. Rogers has served Kentucky’s 5th Congressional District since 1981. With a focus on economic development, job creation, fighting illegal drugs and preserving Appalachia’s natural treasures, he has a reputation for listening to his constituents and fighting for the region he represents. For more information, visithttp://halrogers.house.gov/or follow Rogers on Twitter https://twitter.com/#!/RepHalRogers or on Facebookhttps://www.facebook.com/#!/CongressmanHalRogers.